The Asian Rail Academy (ARA), which was launched in August, aims to revolutionise rail training in the country. It will not only address the shortage of such talent in Malaysia but also provide globally certified rail personnel for international markets. ARA is the first authorised training partner of the UK National Training Academy for Rail (NTAR) and the first training provider in Asia to offer the rail safety certification programmes of Germany-based TÜV SÜD. The academy is also the pioneer training facility in Malaysia to use the Oculus Rift (a virtual reality headset) to enhance the learning experience. Datuk Seri Richard Riot Anak Jaem said in a speech read out by Human Resources Development Fund (HRDF) CEO Datuk C M Vignaesvaran Jeyandran at the launch event that the government is expected to spend about RM160 billion by 2030 on developing rail infrastructure and new lines with the rapid growth in the local industry. The industry will require an additional 51,300 workers to support current and upcoming projects by 2021. About 16,000 of these will be required for rolling stock and maintenance. This was not NTAR’s first meeting with someone from the international market who was interested in licensing its product. “Malaysia acted very quickly. It was fantastic how quickly all of this came together,” says Walpole. All of this was done at hyperspeed when you consider that NTAR was only set up in September 2015. It is 50:50 owned by the UK government and Siemens. “The UK government did a skills gap analysis and discovered that its rail industry would be short 8,900 people by 2020. Both the government and Siemens wanted to set up a rail academy. But rather than set up two separate ones, they decided to open NTAR together. So, 50% of what happens at NTAR is for Siemens [whose staff are trained there] while 50% is externally driven,” says Rathbone. Once the students are base level competent, they can take more bespoke training. “When we first started, we took the course material from Siemens and said, ‘Right, we need to make this more interesting because we are trying to attract new people to the industry’,” says Rathbone. That is because rail is commonly perceived as an industry of the past and it does not typically attract new blood. “The decision was made so that we could start doing interactive training using Oculus Rift, and we wouldn’t stop there. We are now looking at using augmented reality,” he says. The training is based on gaming. “When you are trying to attract young people into the industry, what do they know? In this day and age, it is gaming. So, we deliberately went down that route because we want to keep them engaged and interested in what they are learning and doing,” she says. At NTAR, those without any industry experience have to take 15 courses to earn a diploma. They select five short courses to get an award. Then they take another five courses to get a certificate. Finally, they do five courses to complete the diploma. For the time being, ARA is offering only the certificate programme. This is another reason ARA works with NTAR. “They are not specific to any one train manufacturer such as Siemens or Bombardier. So, we can go to the market and work with many operators and vendors,” says Maran. Operators such as Prasarana and KTM have their own academies. “But we are trying to address the needs of the entire market,” he adds. The difference between in-house training and what ARA is doing is that the academy is backed by a British awarding organisation that will accredit the training, says Walpole. “We can go into any market because globally, when you strip a train down to the fundamentals, there is not much difference,” she points out. ARA is located in Bangsar South. “We currently have two labs with virtual reality headsets, high-end laptops, gaming laptops suitable for virtual reality and the interactive smart board,” says Maran. ARA is currently using trainers from the UK, but it will eventually identify people in the industry who can be sent to the UK for the train-the-trainer programme. “We will identify qualified people and send them to NTAR,” says Maran. They will be people from the industry. “They could be from KTM or Prasarana, for instance, and we will send them over for the programme,” he adds. NTAR will assess the suitability of the candidates, says Walpole. Not because it wants to interfere, but because it needs to ensure that the trainers are of a certain quality to maintain its “outstanding” rating from the Office of Qualifications and Examinations Regulation — the regulatory body for all training provided in the UK. “Eventually, we want to make it local delivery, totally independent of what we are doing where we are. But that is going to take time. We are not saying, ‘There you go. Go off and do it yourself.’ We will help and assist where we can,” she says. This is basically why the programme has received HRDF support. “The HRDF is keen for the Malaysian workforce to have international certification. 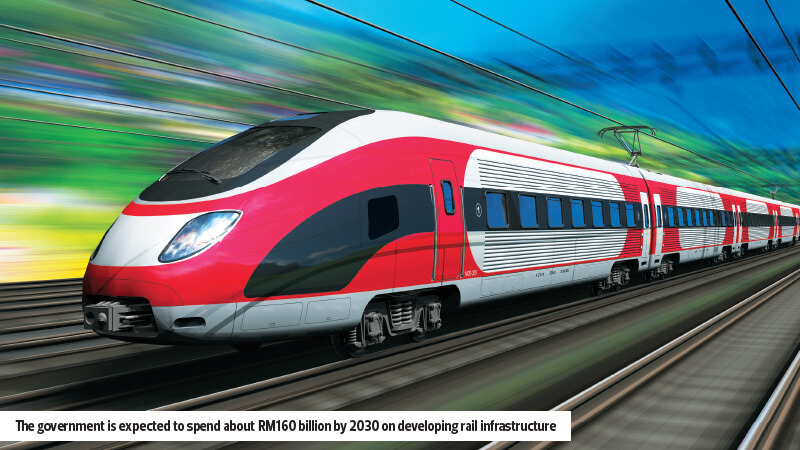 So, let’s say the Malaysian rail industry expands to other countries and our companies take on a project in Abu Dhabi, for example, or Manila or Bangkok. We have to send our workforce there and it would be better if their qualifications were globally recognised. That is what we aim to bring about,” says Maran.